This yard sign is just about everywhere in the city including businesses, churches, schools, and city offices. This one is also popular. I love how the “Science is real” part is in green. 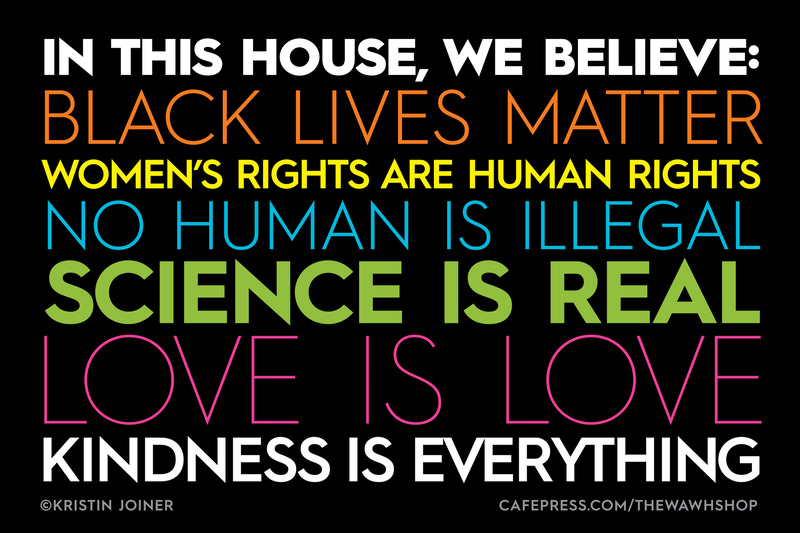 Black Lives Matters signs often accompany the 2 above. Also on businesses, schools, etc. This one is mostly on businesses/community centers but some residents have this sign taped to their living room windows. What’s most interesting is that all the problems this town suddenly has with “hate” came after the anti-Trumpers started putting these signs up. I told a (former) friend that I thought these signs were virtue signaling and devisive and smug I didn’t appreciate that every day everywhere an average citizen can’t take a walk or go to the gym without knowing the political opinions of the home/business/agency owners. NPR claims that people get teary-eyed viewing this supposedly viral sign in front of houses across the country. I’ve only seen two in my neighborhood, thank goodness, and they irritate me no end. Why? The sign is dishonest, unfair and divisive. It is also political, while pretending not to be. First, the sign is not what it represents itself as being. It is not written for an actual neighbor. If it were, the sign would be remote and rude. I welcome new neighbors personally, not by putting garish signs on my lawn. The sign is blatant virtue-signalling, telling the neighborhood that this household is in favor of diversity, love, and immigration…as if lots of other people are not. If it is not a public sign designed to rebuke those people, whoever they are, then why the sign? If everyone in the neighborhood welcomes Americans of all colors and origins—and I know of no Klan chapter in Northern Virginia—then the sign is a straw man. I’m sure, however, that Hispanic-Americans or Muslim-Americans who see these signs on lawns might be moved to think: Wait, does this mean that many people in this community DON’T welcome us as neighbors? How are we to recognize them? The incompetence of people like Harley Brown, a GOP candidate for Governor of Idaho, running in the primary, makes me angry and sad. Some will protest that candidates for office have no ethical obligation to be competent. After all, running a bad campaign is its own punishment: you lose. That is not necessarily true, however, particularly in the states, but even if it is true, you can do a lot of damage while losing. Like any other role, task, or job, running for a high elected office like governor of a state comes with responsibilities. For one thing, other people would like to run, work hard at it, and in the process, help democracy work better by giving voters a choice. Incompetent candidates like Brown not only block someone from running who might be good at it, they also give voters less choice, and sometimes, no choice at all. Those who complain about President Obama should review the pathetic campaign performance of John McCain. All these years to prepare, and he couldn’t master the skill of reading from a teleprompter without looking like he had been zapped by Dr. Strange and sounding like a Rotary Club awardee who begins his speech with “Unaccustomed as I am to public speaking…”? There is more to resent about inept candidates, but let us focus on what makes Brown so awful. 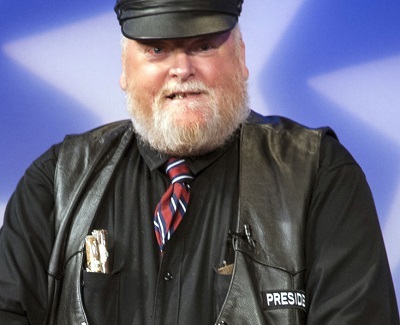 Many Idahoans were introduced to him during the recent Republican candidates debate, in which he began the night dressed like a superannuated biker, which is apparently what he is, or maybe Santa Claus in the throes of a mid-life crisis. Then he launched into what is obviously going to be his real schtick: blue collar, redneck sensibilities as imagined in the stereotyped dreams of Bill Maher, delivered in wince-inducing bumper-sticker slogans and bad jokes that would be the low-lights of the worst stag party routine of all time.